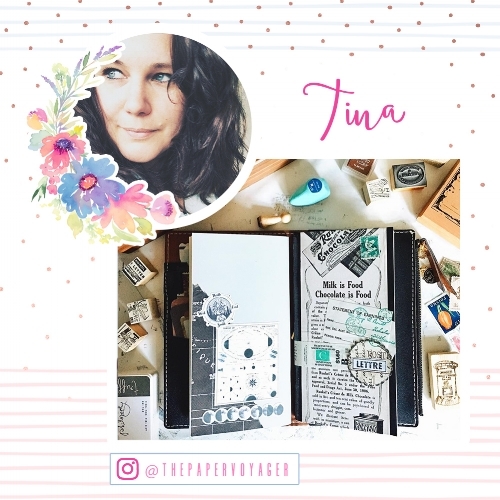 Today we wanted to share how our talented design team member Tina used her Prima Princess Stamp- Claire in her Prima travelers journalal. Tina stamped the princess stamp using the Chocolat Color Philosophy ink pad and colored it with her Prima color confection watercolor paints. The colors she used makes for a perfect Fall art journal entry. - Prima Watercolors "Pastel Dreams"
- Colorphilosphy Ink Pad "Chocolat"
To see more inspirations and projects by Tina make sure to follow her @thepapervoyager.